I’m not ready to start a new project just yet. So the remainder of my holiday weekend shop time was spent making a few accessories for the new bench and trying out a couple of new joints. In Mike Siemsen’s YouTube video, “Work Holding on a Viseless Bench“, he demonstrates a couple of accessories for work holding. One is a doe’s foot batten and the other is a vise chop that utilizes holdfasts for the clamping action. The doe’s foot batten I first became aware of after watching another video presented by the English Woodworker. If I remember correctly that video caused quite a sensation. 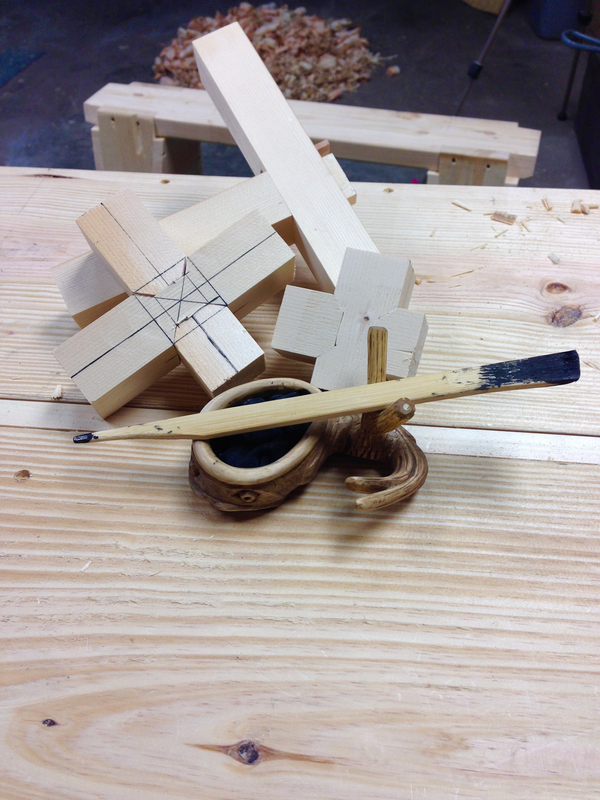 A simple notched stick that adds so much utility to planing when combined with a holdfast. I wonder just how many things like this have been lost to time? Anyway, there is also a blog post by Chris Schwarz in which he advocates, upon the recommendation of Jennie Alexander, adding non-abrasive tread material to the batten. This lessens the chance that the batten will move when cinched down with the holdfast. Chris also advocates making the battens from hardboard, but I had a few strips of 1/4″ birch plywood lying around and made my battens from that. The next addition I tackled was the “vise” chop. Yet again a simple thing that adds a great deal of utility. Basically just a board that rests on pegs instead into the apron of the bench. You then use holdfasts to provide the clamping power. I had a piece of 1-1/4″x6″ white oak handy and made mine from that, but just about any board would work. A piece of scrap is inserted at one end that is the same thickness as your intended work piece. A holdfast is cinched down on the scrap end leaving the opposite end somewhat free so that you can insert your work piece and secure it in place with a second holdfast. Works great. I cut a scrap of 1/4″ and 1/2″ plywood and hung them from a string. Since most of the material that I’ll be clamping in this chop will be 1/4″, 1/2″ and 3/4″ my spacer needs are pretty much covered. If your work piece is of sufficient width to span between the holdfasts, you can forgo the scrap bits. There are two joints that I have been wanting to try and to eventually work into projects. 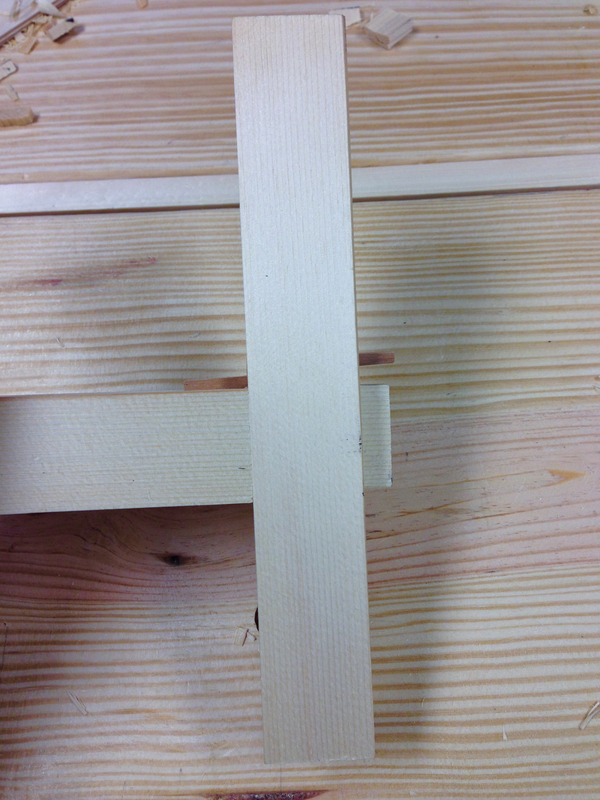 One is a mortise and tenon variant that has a dovetail shaped tenon and is secured with bypassing wedges. 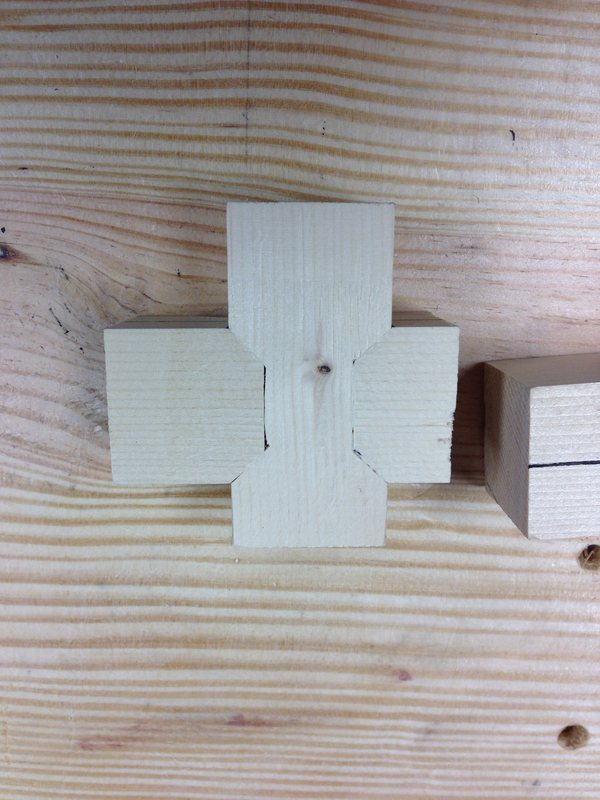 The other joint is a half lap variant that has mitered corners. I’ll try to work up some drawings on these two joints and go a little more into detail as to the layout and execution, but for now I just want to show them to you. 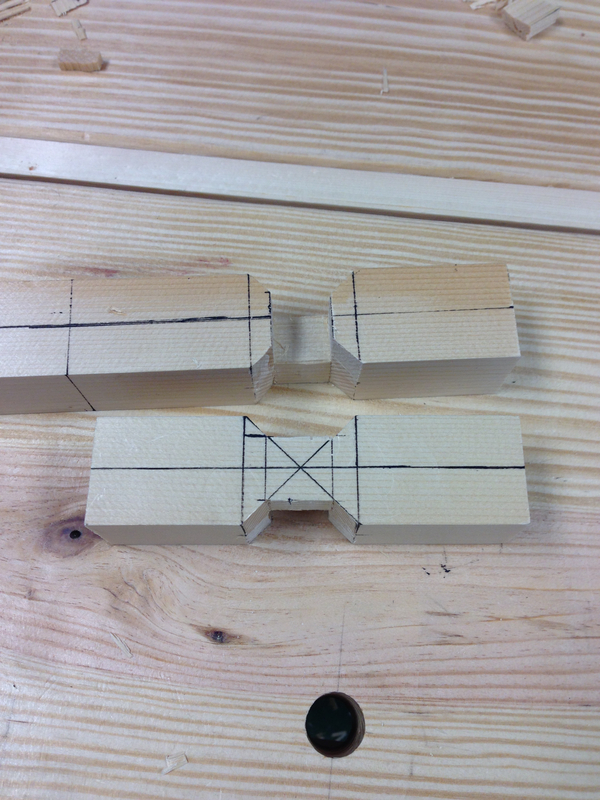 First up is the mortise and tenon variant. 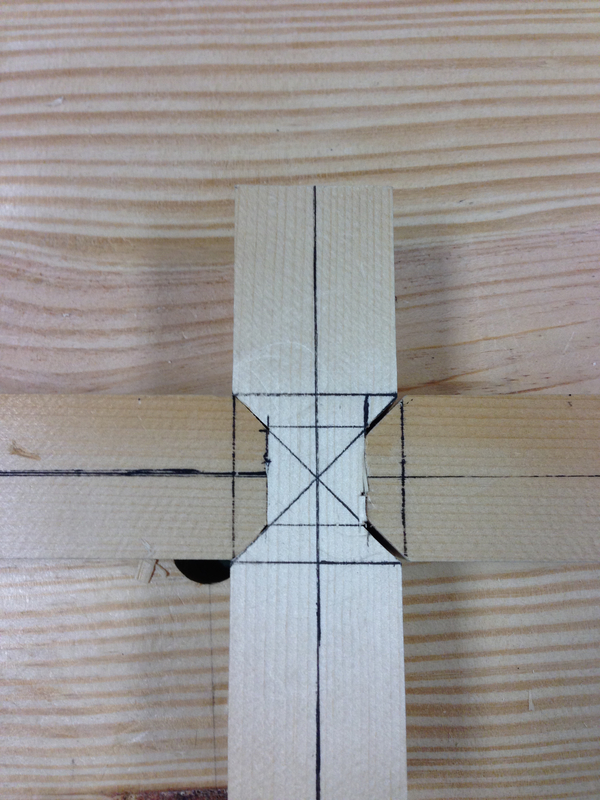 I was surprised at how easy this joint was to layout and cut. My first attempt came out pretty well, but needs some improving. Especially my bypassing wedge execution. This is a very strong joint when assembled and you will see it in future projects for sure. The half lap variant didn’t go nearly as well. Layout was not that big of a challenge, but execution was a different story. In my first attempt I tried sawing the diagonals and that didn’t work worth a damn. I ended up with huge gaps. Surprisingly, even this sloppy looking example is fairly strong. When you fail, try again. For this try I chiseled/paired all of the miters. Far from perfect, but much better than the first one. With all the layout planed out of the way. My time in the shop yielded a few tidbits of productivity this weekend. Plus I was able to put the new bench to work. This entry was posted in workbench and tagged does foot batten, dovetail, half lap, holdfast, mortise and tenon, vise chop. Bookmark the permalink. So how did you like the vise chop? Did it feel secure? 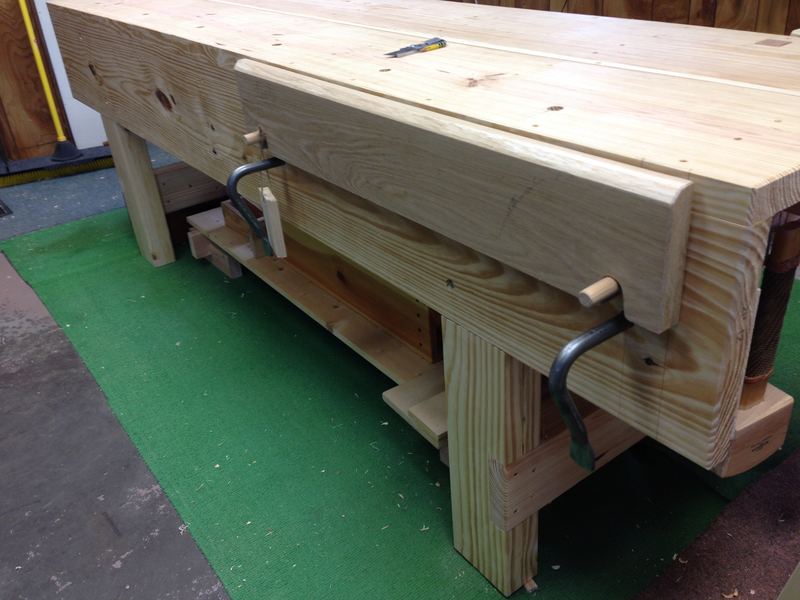 I made a “moxon” vise (we all keep calling them that – and I don’t know what else to call them) that will get a lot of use on this bench when I get it built. Besides the fact that I have it already, it puts work up at a better height for sawing. 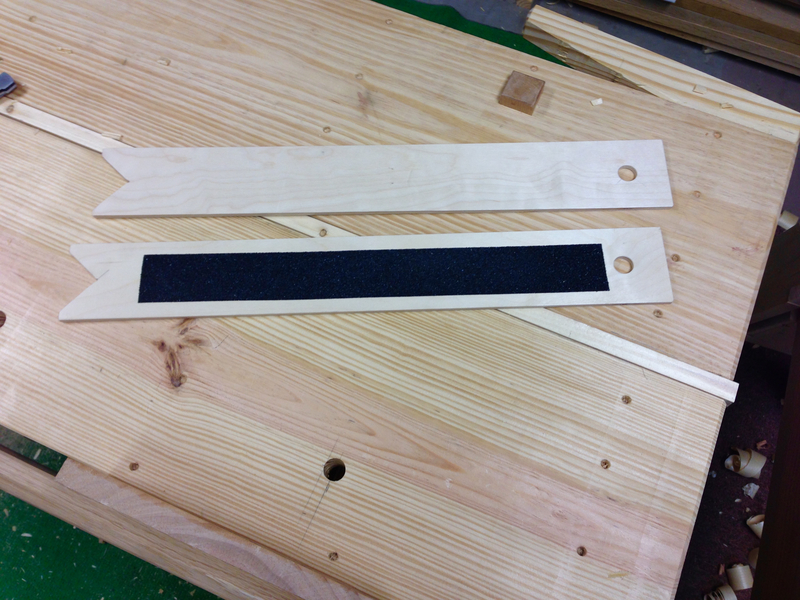 I’m curious how I’ll like cutting the narrow face of boards without a vise. 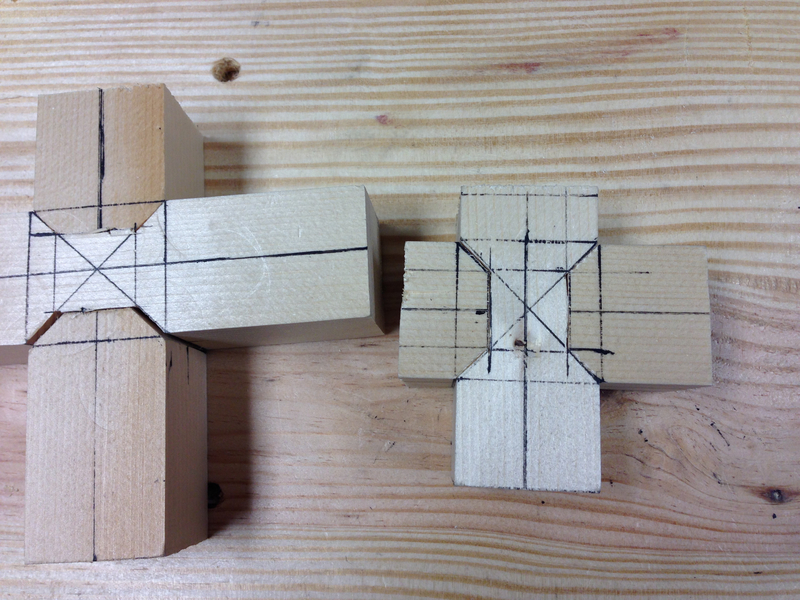 The moxon, or your vise chop could do it, awkwardly. Those are both better on the wide face of boards, I think. Mike showed a method where if memory serves he used the apron of the bench and angled the piece between a holdfast and a peg. Looked like it worked, but until I try it myself I worry about the holdfast working loose under the pressure of the saw cut. The vise chop works just fine. The grip is more than adequate for the tasks that it will be used for. Does it grip like an actual vise? No, but that is not necesarrily a bad thing. One of the drrawbacks to an actual vise is that it locks material down too well. This allows you to use as much force as a you want when sawing, chopping, planing, ect.. Force does not equal accuracy. So with a little less grip you need to use a little more finesse and you must keep your tools sharp. Both good things and I will become a better woodworker for it. The only thing I’ll probably add to the setup is a piece of leather on the chop and the apron. The above holds true for your queston about cutting narrow faces. The method demonstrated in the video is more than adequate for the task. Don’t underestimate the clamping force of a holdfast. If you are really worried about it, just design a vise onto your bench build. But I urge you to hold off on the install until you have used the bench for a while. After using the bench without the vise for a while and you feel you need the vise, buy it and install it. If you look back thru my posts you’ll notice that the vast majority of my “action” photos shows the work clamped in the vise and yet I’m not worried one bit that I no longer have a vise on my bench. I won’t be installing a vise on this bench, not right away anyway. I can see maybe making a leg vise of something on one side one day, but otherwise plan on adopting the vise-less holding methods, on this bench any way. I believe I will have enough space in my shed, and so I’m thinking about adding a joinery bench. 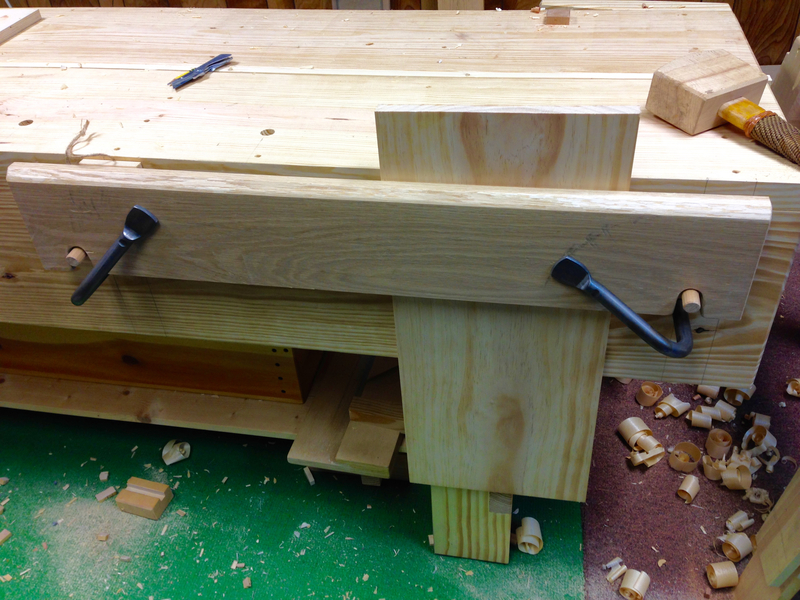 It would be real nice to have a bench at a greater height for dovetails and tenons. Besides the more comfortable height, while I’m only 45 my eyes are surprising me with how bad they’re getting. Wouldn’t need to be nearly as large as this bench – haven’t thought through the design, but plenty of possibilities. Very good point about less clamping force making you work better. Same principle as Mike showed with planing when he talking about how if you weren’t exerting pressure on the whole plane like you should, the piece would raise up behind you. Before I saw that video, I never knew this was something to even watch out for. After, I tried planing that way, and it worked – better than it used to. Exactly the same principal as demonstrated in Siemsen’s video. I’m 45 as well and have resorted to drug store readers for some tasks. Force is rarely the answer to any woodworking problem. Sharp and control trump all. Always. That mitred half lap is a wicked joint that I could have used for the model windmill blades I recently made. I must make a copy to remember it by for another time. The bypass wedged mortise and tenon I currently don’t see a need for. I have used several wedged M&T variants, but not that one. Is it intended for disassembly, like the pegged M&T? If so, I admit it is neater. The mitered half lap is a nice joint, but tricky to execute. I’ll need some more practice for sure. The mortise and tennon variant can be handy if you have a need for a joint that needs to be taken apart. The other advantage is that it has the abitlity to pull an assembly together when installed, no need for clamps. 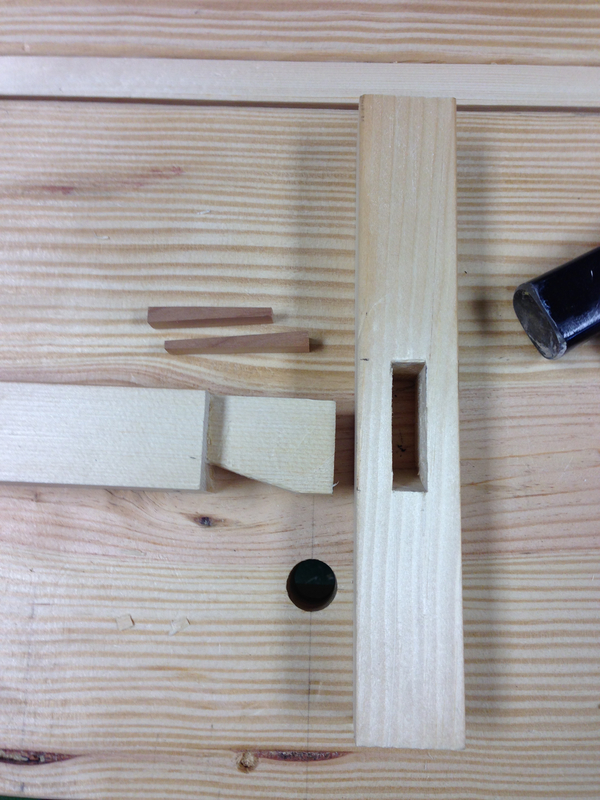 The wedges can be glued and then trimmed flush. Will I use it all of the time? No, but it can be a handy joint to have at my disposal. Looks like your bench came out well and should provide you with years of enjoyable service. My biggest challenge is paralysis by analysis. In my day job I am not be allowed to make any misques so that naturally bleeds over to my woodworking. Therefore I have built the project in my mind literally hundreds of times before I even take the first saw cut. Do you or have you had this issue? I would love to get beyond this because the list of projects grows exponentially daily. My day-job is much the same. That is precisely why I like working with wood. It’s not life or death, it’s just wood. The best advice I can give you is to buy some wood and go for it. You will be surprised at how liberating it can be. It’s not like I lack wood ( I have in excess of 10K bdft of rough cut lumber ranging from Pine to Mesquite in hardness and from 4/4 to 16/4). It’s just the thought of failure. It is funny that my wife and I were talking about this very thing this morning and she agrees with you. She says just do it and if you make a mistake then we have some more wood for the fire pit. LOL…then the only thing holding you back is your own fear. Sharpen your tools and get to it. Your wife is right. Worst thing is that you create a little extra firewood. 😉 Woodworking is not black and white or pass/fail. Its infinite shades of grey. There is no perfect design nor perfect execution of a design. Think of it as art. As such, it will be fluid. Make it musical not mathematical. I once offered a class for people like you. It was called, “Burn What You Make”. The plan was to use inexpensive materials, build things and at the end of the class pile it all up and have a nice bonfire, alas no takers, but I believe the premise is a good one. The worst you can make is decorative firewood. Start simple and low pressure, don’t tell people you are making something and don’t show it to them and point out all the mistakes when you are done. If someone asks what you are making say, “mistakes” or “$2.00 an hour” or “firewood”. If fear of failure is the problem then tell yourself you are failing to start. Good Luck! Thanks for the input. I do alpoogize for the possible misleading of my post. I have made several items ( 2 blanket chests, a shaker table, turned bowls, pepper shaker, joiners chest…..). All of these items were taken at classes I attended at Woodcraft or at Roy Underhills school. The only exception is a card box for our sons wedding. I can conceptualize a project but when I have to take it from that to the finished project that is where I get hung up. I have your “Naked Woodworker DVD as well as your class on Craftsy (both are very good entry level items). In my day job I work with my hands daily and perform some very intricate and demanding tasks with very precise and professional results. I just need to let myself go and let that sense of task completion prevail. I like that vice chop and I have used a doe’s foot a few times before. I am interested in knowing after you have used the vice chop for a while, how you like it. I may want to do something like that with my future workbench. I’ll be doing a follow up post or two after I get to use it a little more. I’ll cover any modifications as I add them as well. Seeing the comments on the vice chop has reminded me that I’ve seen something about it elsewhere, but can’t remember where that was. Anyway, the thing I saw suggested that the chop should have a very slight but gentle convex curve to the inside face, so that pressure is applied first to the centre of your work, and then progressively towards the edge as the holding mechanism (holdfasts) tightens. This counteracts any tendency of the chop to flex under pressure at the ends. Did you do that with yours, or is it flat? 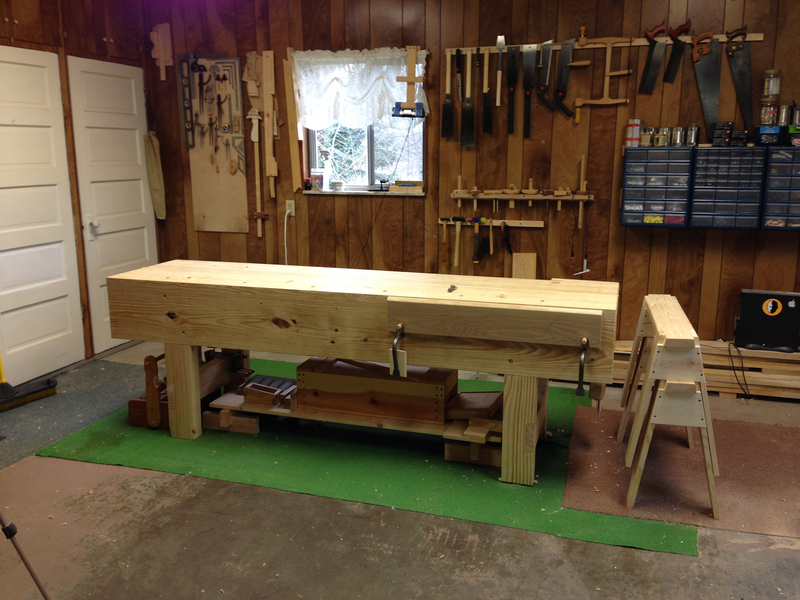 Anyway, this post of yours has finally decided for me, my new bench _will_ have a front apron, and one of sufficient thickness for the holdfasts. I will still be fitting that big old quick release vice that I love. I would not fit one like the one you used to use, except perhaps as an end vice. I believe that the chop will need to have a crown much like a clamping caul depending on the material used. How much crown is the question at hand. Right now my chop is flat and holding quite well. 1-1/4″ thick white oak doesn’t have much flex. I’ll use it like this for a little while then add a little crown if I think it needs it. You will note that it gives a nice fitting of the cove. It is in some way related to fitting together frame and panel where there is a molding at the edge of the frame or to window braces. Chris Hall doesn’t try to make it fit at the first cut. Chris Hall is making some really intricate joints I can only dream of. Chris Hall’s work is on a whole other level. Actually, several levels above what I’m doing. I was testing my layout and cutting accuracy with the one-shot go. I’ll make a few more and actually fit one to the other as Chris demonstrates in his post. There are a lot of surfaces that need to match perfectly for this joint to look nice. One of the nice things about this joint is the ability to add a bevel to the edges of the piece before final assembly. As long as the bevel is no wider than the mitered corners. Where did you get your holdfasts? Tools for Working Wood. They work great. I like the approach of testing the joints you will make. I’m doing that usually, if I will start a new project using a method I haven’t used before to get somehow familiar with it. BTW you shop with the new bench looks great. Thanks. I’m liking the new setup so far. The bench is larger, but I feel like I have more room. There is no substitute for practice. Even if you have made the same joint hundreds of times, it pays to make a few practice versions before diving into the real thing. More so, for new joints or techniques.